A 20th century vintage collectible pair of fully restored beechwood armchairs with a raked back and seat built of intertwined rope strings by Francis Jourdain, built in France, circa 1930s. This pair is adorned with beautifully carved details on the armrests and structure. A model of this style is represented in the Pompidou Museum in Paris and a sketch of this creation can be found on the artist's wikipedia page. 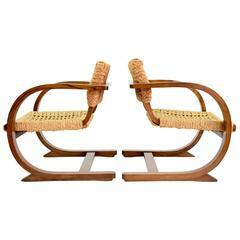 Francis Jourdain (1876-1958), pair of Minimalist armchairs, France 1930. Structure in oiled oak, openwork armrests, spacer stand, original trim in braided ropes. This Francis Jourdain chair features a wooden frame and a wicker backrest and seat. With octagonal-faceted front legs and saber back legs. Pair of Green Art Deco armchairs, in original condition. Art Deco armchair, in beechwood with a raked back and seat built of intertwined rope strings. The armchair is in the style of the French designer Francis Jourdains. Fully restored pair of Art Deco armchairs in new upholstery, stabile construction, walnut weener, removable seat cushions.